Twenty years after a truck bomb exploded at the Alfred P. Murrah Federal Building in Oklahoma City, hundreds gathered at the site Sunday for a morning ceremony to commemorate the 168 victims of the 1995 bombing. The attack, which released an explosion equivalent to 4000 pounds of TNT, left hundreds more injured. Those survivors, plus relatives of the victims, and state and federal government officials, made up the crowd at the Oklahoma City National Memorial and Museum — which replaced the decimated federal building. Survivor Richard Williams, flanked by two grandchildren, opened the ceremony with a recitation of the museum’s mission statement. "We come here to remember those who were killed, those who survived and those changed forever,” Williams read. “May all who leave here know the impact of violence. May this memorial offer comfort, strength, peace, hope and serenity.” The opening address was followed by 168 seconds of silence — one for each of the victims — before Christian performer Michael W. Smith sang the National Anthem. 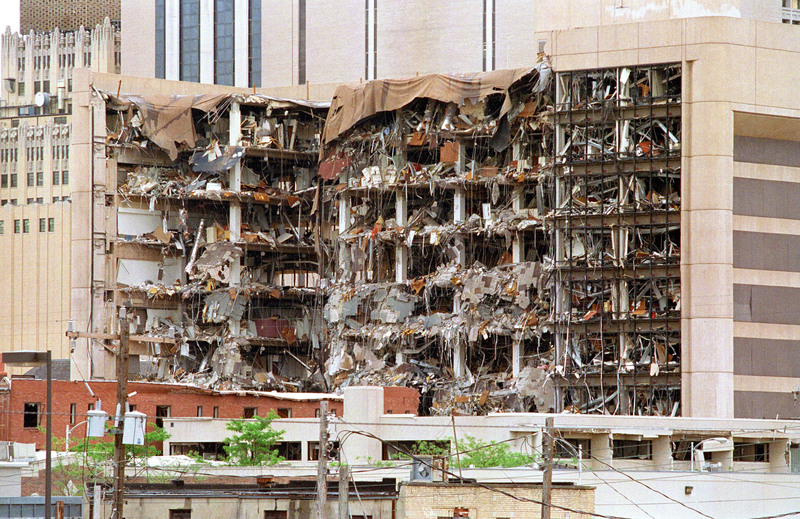 The attack — one of the deadliest domestic terrorism incidents in the country’s history — was masterminded by Timothy McVeigh, an Army veteran with anti-government views. Intended to strike a blow to the federal government, the bombing left a tragic trail of collateral damage in its wake. In 1995, the former building also held a day-care center, which the explosives-laden truck parked directly beneath. Twenty-one children were at the center on April 19, and only six made it out alive. I mostly came here to thank you today. … There's still people who somehow think they can matter more and they can make a statement by killing innocents and snuffing our possibility. … They're wrong. As long as people like you make the right decisions with their mind and their heart. The lessons learned twenty years ago on April 19, 1995 — and in the months and years thereafter — have changed the way America responds to violence and terrorism. McVeigh was executed in 2001 for his part in the bombing, while his accomplice Terry Nichols is serving a life sentence. Meanwhile, the survivors of the bombing are still in many cases struggling to come to terms with what happened, with one in four exhibiting PTSD markers. First responders, too, were profoundly affected by the tragedy. Priscilla Salyers, who survived a five-floor fall after the blast, has battled with depression and survivor’s guilt in the intervening years, but bears an uplifting message. In the lead up to Sunday’s ceremony, she told Reuters, “I hope we are an inspiration to those who are starting their own journey to healing … I hope people see that life goes on. So many of us have picked up the pieces and kept moving forward."